A group of down-and-out accountants mutiny against their bosses and sail their office building onto the high seas in search of a pirate's life. An American family in the streets of Naples. Dennis: I keep your potato. 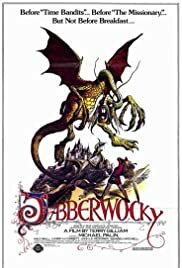 Q: Is "Jabberwocky" a sequel to "Monty Python and the Holy Grail"? Q: How does it relate to the Lewis Carroll poem? Q: Why does the Chamberlain call the King "darling"? Terry Gilliam, in 1976, did something similar to a member of a rock band going off (while the 'band' not having yet broken up but on hiatus) and recording a solo album with his film adaptation of Lewis Carroll's poem Jabberwocky. However, like a solo effort, one expecting a full-on presentation of how the actual band plays together, might be disappointed. As it is with Jabberwocky, as Gilliam has said of it on the commentary on the DVD, "(Jabberwocky) was a transitional film, from Holy Grail to the other projects." This comes with pros and cons for certain viewers, some with more cons than pros. The story is expanded upon from the original, surreal battle hymn of sorts from Carroll. The naturally funny Michael Palin stars (in only one role, following the narrative structure instead of the episodes of Python) as a son of a barrel-maker, who has to live on his own, wandering around for food. Meanwhile, a monster of demented, horrible proportions terrifies and slays the citizens, and the King (running his minions in a shamble), gets a tournament to decide who will kill the beast and marry the Princess. These two stories go side by side until the inevitable climax, when the silliness builds up to something very, very bizarre, but fun. The thing about Jabberwocky is that there are so many jokes going on, visual puns, basic physical gags, trademark 'British' innuendo and irony, and the awesome, brash, curious style of Terry Gilliam (director, co-writer, and bit-player). Sometimes the biggest laughs come from unexpected places, sometimes not. And, unfortunately, a good number of jokes either fall flat or are not exactly laugh-out-loud funny. But one thing that is pulled-off well is a sort of cartoon-like approach to the film as a whole; one could imagine this same material, more or less, being translated to the kind of animation that came in The Hobbit. For its low budget, Gilliam and his cinematographer (who also implied a similar visual look on Holy Grail) make this world seem extremely real, and go for being appropriately stylish with many of the moves. In fact, it's a very serious-looking film, and that it's a comedy is almost an after-thought.